"A swarm of microearthquakes, accompanied by weak harmonic tremor, occurred beneath the NE flank of Agua de Pau Volcano on Sao Miguel (figure 2, zone 1) 23-24 May 1988. Seismometers recorded 383 earthquakes; the largest had intensities of MM IV-V in villages along the N coast. A similar but smaller swarm occurred in the same area in 1983 and was recorded by USGS seismographs. Numerous, small, normal faults (including some that show scissor-type movement) displace basaltic, tristanitic, and trachytic vent deposits and flows in this area. However, the area has had no eruptions for about 3,000 years and is the least active of the five volcanic zones on Sao Miguel that have erupted during Holocene time. Figure 2. Approximate epicenters for earthquakes on and near the island of Sao Miguel, May-October, 1988. Courtesy of R. Moore. "A small swarm of microearthquakes occurred 24-26 June  on the S flank of Agua de Pau Volcano (zone 2). Sixty-four earthquakes were recorded; the largest had intensities of MM III-IV in nearby villages. No tremor accompanied this episode. "A small swarm of microearthquakes occurred 6 July  near the S coast of Sao Miguel (zone 3). Fifty-one earthquakes were recorded; the largest was felt and had an intensity of MM III-IV. No tremor accompanied this episode. The Global Volcanism Program has no Weekly Reports available for Agua de Pau. The Agua de Pau stratovolcano in central Sao Miguel Island contains an outer 4 x 7 km caldera formed about 30,000-45,000 years ago and an inner 2.5 x 3 km caldera that was created about 15,000 years ago. 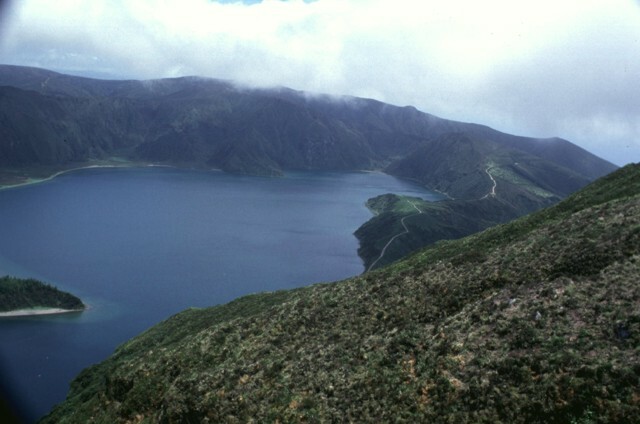 The younger caldera is partially filled by the Lagoa do Fogo caldera lake. Several post-caldera lava domes were emplaced on the northern and western flanks, but activity in the caldera did not resume until about 5000 years ago. The 3-km3 Fogo-A plinian pumice-fall deposit, the product of the largest-known Holocene eruption in the Azores, was emplaced at this time. Numerous flank cinder cones mark radial and concentric fissures, some of which have been active during historical time. The latest trachytic explosive eruption took place during 1563. Prominent hot springs are located on the NW flank. Capaccioni B, Forjaz V H, Martini M, 1994. Pyroclastic flow hazard at Agua de Pau volcano (Sao Miguel Island, Azores archipelago) inferred from the Fogo A eruptive unit. Acta Vulc, 5: 41-48. Moore R B, 1983. Preliminary geologic map of Furnas volcano, Sao Miguel, Azores (1:15,000). U S Geol Surv Open-File Rpt, 83-395. Moore R B, 1986. Preliminary geologic map of Agua de Pau volcano, Sao Miguel, Azores. U S Geol Surv Open-File Rpt, 86-192. There is no Deformation History data available for Agua de Pau. There is no Emissions History data available for Agua de Pau. 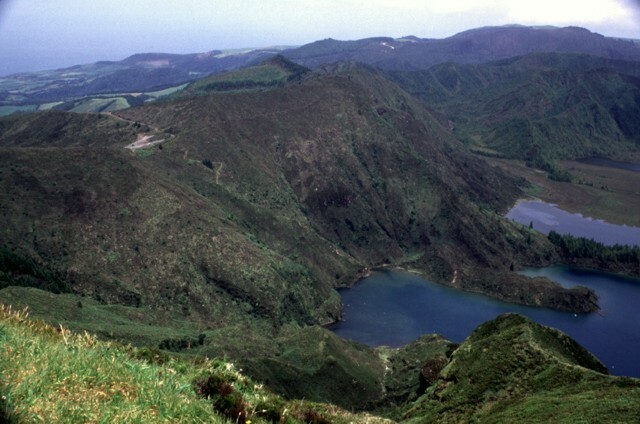 The inner Agua de Pau caldera, seen here from the western caldera rim, is now partially filled by Lagoa do Fogo caldera lake. The caldera was the source of a major explosive eruption about 5000 years ago. This eruption produced tephra layer Fogo A, which marked the renewal of major explosive activity within the 15,000-year-old inner Agua de Pau caldera. The eruption produced pyroclastic flows and thick mudflows that reached the northern and southern coasts of Sao Miguel Island. 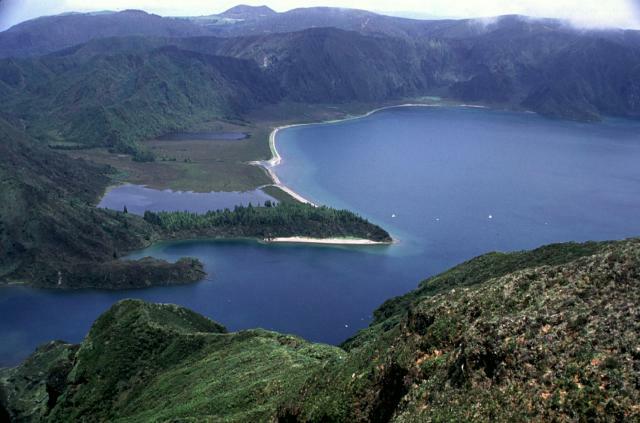 Lagoa do Fogo ("Fire Lake") appears to occupy a line of craters possibly dating from a major eruption during 1563. A plinian eruption from the central caldera began on June 28, 1563, depositing trachytic pumice eastward over the island. On July 2, a NW-flank effusive eruption began, which lasted until the end of July and produced a lava flow that reached the northern coast at Ribeira Grande. 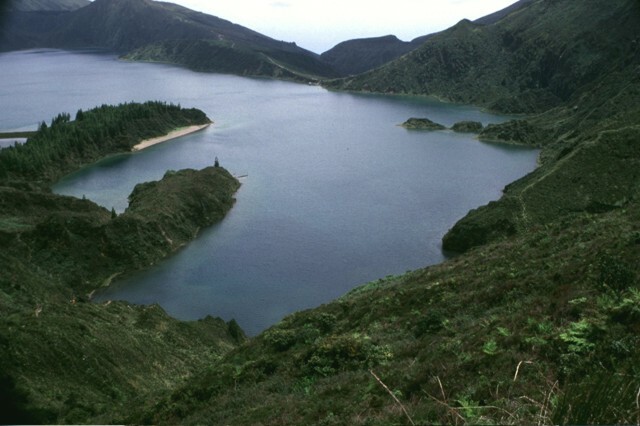 Lagoa do Fogo lake, seen here from the west, partially fills the younger of two Pleistocene calderas on Agua de Pau stratovolcano in central Sao Miguel Island. Several post-caldera lava domes were emplaced on the northern and western flanks of the volcano, but activity inside the caldera did not resume until the eruption of the 5000-year-old Fogo-A plinian pumice-fall deposit, the product of the largest-known Holocene eruption in the Azores. Numerous cinder cones have erupted on the flanks of Agua de Pau during historical time. Photo by Rick Wunderman, 1977 (Smithsonian Institution). The forested ridge in the center of the photo is part of the northern rim of the 2.5 x 3 km inner Agua de Pau caldera. The Serra de Agua de Pau hills in the background mark the northern rim of an outer 4 x 7 km caldera of Pleistocene age, which formed approximately 33,000 years ago. Lagoa de Fogo caldera lake (lower right) partially fills the inner caldera. 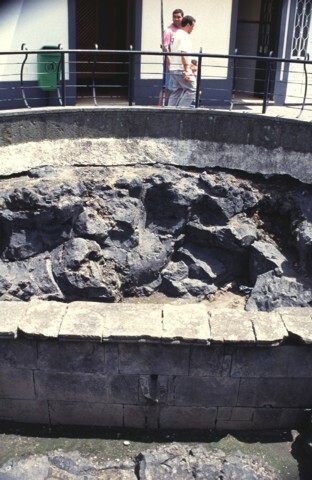 A public fountain at Ribeira Grande on the northern coast of San Miguel Island was buried by a lava flow that was erupted from Agua de Pau volcano in 1563. The fountain had been constructed sometime during the half century prior to the 1563 eruption. The lava flow, which originated on July 2 from a vent of the NW flank of Cerro Queimado, remained active until the end of the month. It was preceded by a major plinian eruption from the central caldera that began on June 28 and deposited trachytic pumice eastward over the island. The Global Volcanism Program has no maps available for Agua de Pau. There are no samples for Agua de Pau in the Smithsonian's NMNH Department of Mineral Sciences Rock and Ore collection. Large Eruptions of Agua de Pau Information about large Quaternary eruptions (VEI >= 4) is cataloged in the Large Magnitude Explosive Volcanic Eruptions (LaMEVE) database of the Volcano Global Risk Identification and Analysis Project (VOGRIPA).